You will see a number of images on this page, click any image to get a larger version of it. Don’t forget to look over the MixW review. MixW has a mode which the user can select where it will aid you in contesting. MixW must be in contest mode to use contest mode. Once in contest mode, MixW will show the log differently, allow a separate set of macros for each contest, keep a running score, (and in some cases other data), and in general make your contesting life simpler. If you couple this mode with a custom set of macros, you can make some impressive scores, as long as you have a good signal. MixW uses a set of files called DLL’s, and DOM files to configure itself for each contest. You get these files from the contest page, located at the MixW site. There are a few other sites with contest DLL’s, such as Victor N. Kosobokov’s site, Victor has a number of DLL’s available there, and has done a wonderful job of adding functionality to MixW. 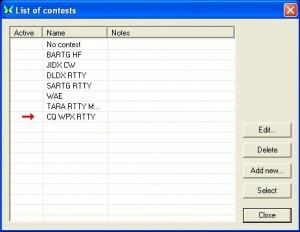 A DLL file controls how MixW works, and a DOM file contains the list of which countries and prefixes are available for the contest in question. You MUST have a DLL file for a contest in order to get stats, but you MAY NOT need a DOM file for a contest. If no DOM file is specified, then MixW will assume a base set of countries. For a list of which stats/dll/dom files go with which contest click here. Once in contest mode, you will probably want a set of Macros to use. A macro file contains a number of pre-canned responses, some of which can be a monotone incrementing numbers to send as the exchange. If for instance you want to answer a contest CQ, you would just press the ID Macro, which contains only your call. Upon pressing the ID macro, MixW will key your transmitter, send your call sign a few times, and then unkey your transmitter. MixW would them decode the response, print the response, and you would make a decision about what to do. If the calling station answered your call with an exchange, MixW would place the needed information in your log, the call, the exchange number, the prefix etc., (that is what the DLL does, it sets things up so MixW can do this), and then you would answer the exchange with your exchange data from a different macro. This is a very powerful feature, as it will let you transmit your exchange, with just the touch of a mouse. Your sent data will be logged, your received data will be logged, and the DLL will also score the contest for you, all in a very short time. This allows you to actually focus on the contest, and not on operating the software. This translates to higher scores. Each contest needs a different DLL, and possibly a different DOM file. In order to play in the contest, you need to pre-program MixW for that contest, using the DOM/DLL files. Lets look at how to set up for a contest. First you need to know about the contest, I use WA7BNM’s Contest Calendar Site. Once there select the 12 month Calendar. 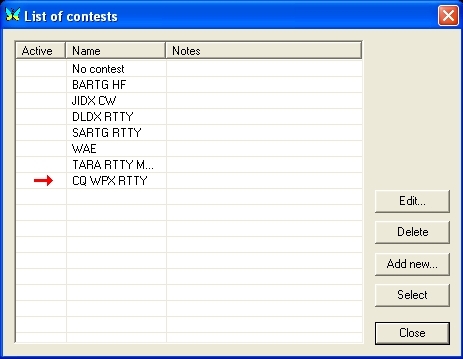 Now select the BARTG HF RTTY Contest. That will give you the needed information to set up MixW and the Macros. The next thing to do is to find a DLL file for this contest at the MixW site, or at Victor’s site. 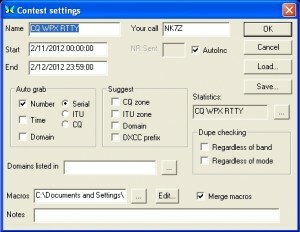 The names do not always match for the CQ WPX RTTY contest I use the file named CQ WW RTTY WPX. Once downloaded unzip it, you should get a single file named StatsWpxRttyRtty.dll. You now need to place that file someplace. The next section will take you through how to download, unzip, and move the needed file to the correct directory for MixW. If you already know how, skip the downloading and installing section and move directly to the Setting Up MixW for a contest section. 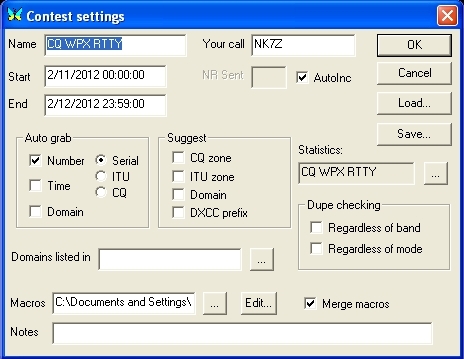 Now, lets set up the software for a real contest… Lets use the CQ WPX RTTY contest. First you will need to find the DLL for it. First thing is to download the DLL file. The list of DLL files can be located at the MixW site. Click the link and a new window will open at the download site for MixW. Once this new window or tab is opened, find the CQ WW RTTY WPX file, (it’s about 3/4 of the way down the list), and download to your desktop. You should have a file named “StatsWpxRtty.zip”, on your desktop when you are finished. Now double-click it. That should open a window containing a file named “StatsWpxRtty.dll”. Move that to the desktop, by dragging it from the opened zip window, to a blank spot on your desktop. Once done, close all windows on the computer, leaving yourself at the desktop. Open “My Computer”, then open “Documents and Settings”. At that point you will see a number of different directories. Select the one which has the same name as the username you logged into your windows machine with. In my case, I use admin, as the user name. I see the directory named “admin”. You will see something different, but the idea is to get inside that directory. Once in, you will see a directory called “Applications Data”, open that one. Now in the “Applications Data directory, you will see another directory called “MixW”. Open the MixW directory, and now you will see another directory called “plugins”. Move the file on your desktop to that directory. Now close all windows, and get back to your desktop. DO NOT PLAY WITH ANYTHING IN THIS DIRECTORY UNLESS YOU KNOW WHAT YOU ARE DOING! JUST MOVE THE FILE IN PLACE AND CLOSE ALL WINDOWS. Selecting Contest Mode for MixW. Showing the current score live. Setting up the colors of call signs to aid you in finding the best station to work. Operation of MixW under the setup described. If you don’t have MixW running now, start it. Look across the top of the MixW program, and you will see the main menu of items, select VIEW, and in the drop down menu, select CONTEST MODE. This will open a dialog box, showing any contest for which a DLL file is in place it should look something like the one below. Now move your mouse to the CQ WPX RTTY contest and left click it, that will add the little red arrow. Next move the mouse to the “SELECT” button and left click it again. If all is well you will be rewarded with the following Dialog Box. You double-click the station call sign, as displayed. MixW looks up the station for you, and fills in some data in the log, like the data, time, frequency, etc. You send your call sign via a MACRO, note, you can be sending your call sign, AND then double-click to fill in the data in step 2. The other station responds to your call sign with the exchange, (see above). 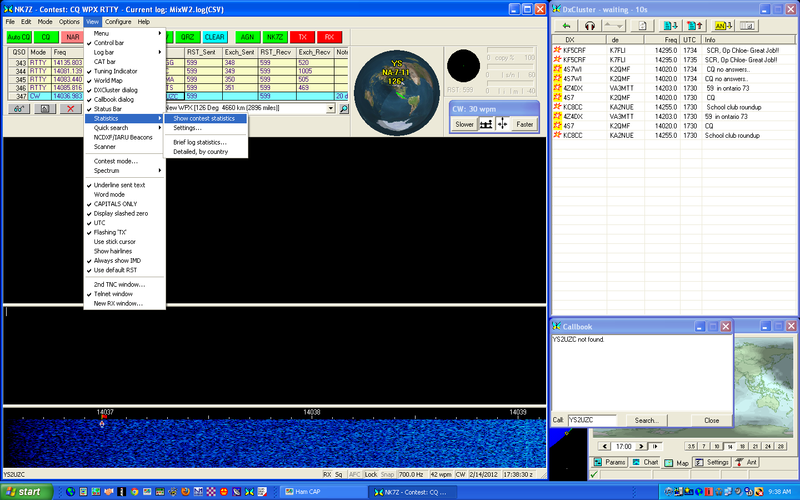 MixW GRABS the serial number, (remember, you selected this in the contest setup), as the other station transmits it, and inserts it into the log. If you approve, you select the MACRO to send your exchange to the far station. MixW also, writes this to the log for you. This forces your rig into transmit mode, the “NK7Z” is sent as text, and theforces your transceiver into receive mode. Pretty simple. The next MACRO uses the built in function of MixW to send the serial number, which increments each time you save to teh log. The extra command, <SAVEQSO>, writes the completed QSO to the log, and increments the serial number, preparing you for the next contact, being one digit larger than this one. You will see that each band you have been working on is broken out, based on the needed items… The example above shows that I should be operating on 40 Meters, in order to maximize my score, for the effort put out. I have very few prefixes there, (that’s the idea of this contest, get as many prefixes as possible), so for the best bang for the buck, I should operate on 40. I have a HUGE noise level on 40, so I can’t, that hurts my score greatly. By adding a check mark under “New WPX”, and selecting a color, when ever a new unworked prefix is shown, it will be in the color you select. In my case, I use bright red, it stands out, is screams to me to double-click that call. 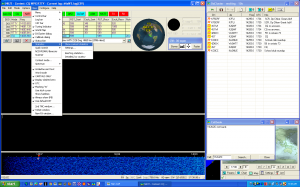 You see an RTTY signal in your passband. You click the mouse to move the MixW tuning cursor to that signal. You watch it for a moment, to get the call sign. If it is one you want, you click the MACRO to send your call at the appropriate moment. If the station answers you, he/she sends the exchange, and MixW writes it to the log line. You decide if it is correct, and if MixW grabbed the serial number correctly. If so, then you hit the send exchange MACRO. If not, then go to step 3, and start again. MixW will send your exchange. MixW will write your contact to the log. MixW will update your stats, and show you your current score. If you set up MixW, as shown above you should have a lot more fun operating a contest, and your scores should show it. Please feel free to leave comments here in the comments section!. Don’t forget to join the MixW group on Yahoo. There are a lot of very sharp people there, and they are all willing to help you in setup. Please feel free to leave a comment, good or bad, or corrective in nature below. Don’t forget to look over the review of MixW software.